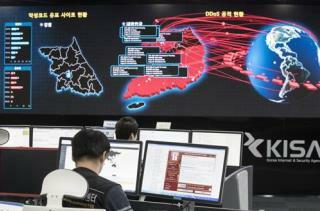 (Newser) – It's official, according to Trump aide Thomas Bossert: The US publicly blames the massive "WannaCry" ransomware attack earlier this year on North Korea. "We do not make this allegation lightly. It is based on evidence," Bossert writes in the Wall Street Journal. He accuses Pyongyang of being "directly responsible" for the "cowardly, costly, and careless" attack that hit hundreds of thousands of computers in more than 100 countries. "We are not alone with our findings, either. Other governments and private companies agree," Bossert writes. "The United Kingdom attributes the attack to North Korea, and Microsoft traced the attack to cyber affiliates of the North Korean government." It is fun to be a hacker as anyone can do it with glee at disrupting use of the Internet and our facilities and communications dependent on it. One kid in a basement can have fun doing it, even if it kills someone inadvertently, after all, collateral damage unintended shouldn't be blamed on the hacker. "North Korea has acted especially badly" Where did Trump find this wordsmith?! Carl's Jr Jr?